A Canadian man convicted of sending mail bombs to several businesses and his ex-wife has been sentenced to life in prison. Guido Amsel was found guilty earlier this year on four counts of attempted murder and numerous related charges. 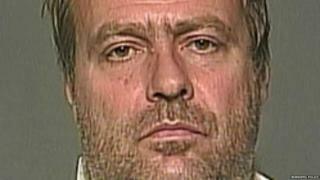 He sent three explosive devices by mail in 2015 and left a similar device at ex-wife's Winnipeg residence in 2013. Amsel will serve the life sentence without possibility of parole for 10 years. The life sentence for the mail bombs will also be served consecutively to a separate 15-year sentence for the 2013 incident at his ex-wife's home, Manitoba Judge Tracey Lord said on Thursday during his sentencing. All four incidents involve explosive devices being placed at, or sent to, locations connected to his former wife or to lawyers involved in their ongoing litigation. Judge Lord said Amsel has not shown any remorse for the offences. "His rehabilitation is questionable at best," she said. Three mail bombs sent in 2015 were designed to explode and spread shrapnel, and contained the same explosive substance, according to court documents. A bomb placed outside Ms Amsel's residence in 2013 caused damages but no injuries. One woman, Maria Mitousis, was badly injured by one of the devices. She is a lawyer who represented his ex-wife during their divorce and a later case. Amsel and his wife separated in 2000 but were embroiled in ongoing legal proceedings related to a shared business and child support regarding their son. Ms Mitousis's right hand was amputated and her other hand was badly damaged after a device sent to her office exploded, and she also suffered burns to her torso and feet. Judge Lord noted her "life was altered in every respect" by the bomb. "The physical impact of the explosion has been life changing in many ways for Ms Mitousis; ways that according to her, she deals with every waking moment," she said in her decision. The device sent to Ms Mitousis alerted the other recipients to suspicious packages they had received. Those two packages were detonated by police without any injuries.